On the lead up to one of the biggest days of the year, eight-year-old Lillie-May Holey enjoyed her VIP experience with Santa at Four Seasons Shopping Centre, Mansfield. The prize came as part of a package for Lillie-May after a Mansfield based business - Hall Fast Industrial Supplies, bid £1,500 in the Mansfield 103.2 charity auction in aid of John Eastwood Hospice Trust. Hall Fast Industrial Supplies, of Anglia Way, bid for the switch-on prize package, which it then donated to Fountaindale School in Mansfield as part of its on-going support for the school. Lillie-May was chosen as the lucky winner, after names of children were randomly pulled out of a hat. - A VIP experience with Santa, which took place on Wednesday 23rd December and included breakfast with Santa, his helper, free entry to the Four Seasons grotto and a gift and photo. 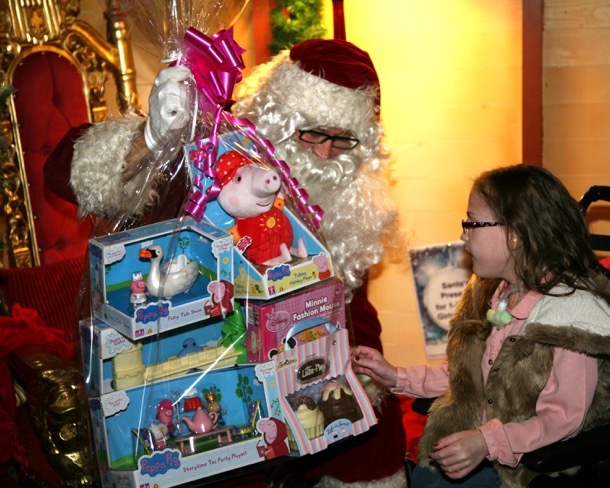 Lillie-May’s mum; Amanda Munt said: “Thanks to Hall Fast Industrial Supplies, Mansfield 103.2, Fountaindale School, Mansfield District Council and Four Seasons Shopping Centre, Lille-May’s Christmas has been made extra special. As result of Lillie-May’s prematurity, she suffers from various complex problems including developmental delay, is on oxygen and has a tracheostomy for chronic lung disease, and has heart problems. After having over 40 operations since Lillie-May was born at 23 weeks, a truly special experience was the perfect Christmas gift.